On the fourth of July, I ran a midnight race. It took place in Seattle right under the space needle. There were thousands of runner. It was such a beautiful run, with all of the city lights beaming in the midnight sky. My time was 27:20 which isn't that great, but it is a work in progress. 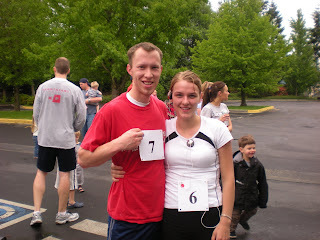 Yesterday Jared and I ran another 5k in mill creek, which is north of Seattle. Jared pushed the kids in the stroller. It was alot of fun with all the people, but it was about 90 degrees, which dosn't make for a very good run. Needless to say my time was worse than my last one, at 29:17. Jared wasn't far behind with 29:59. I joined a running club this week, we go running together every monday night. They run about 5.5 miles each week. It will be a good way for me to improve my time and endurance. did you join the club that starts at fleet feet? Oh that is so awesome!! I thought about joining my gym's running club too, it's not very much. I think I'll do it. Do you have any good tips for increasing your speed? I really want to be fast, and I am so not! !